To introduce different experiments to test basic understanding of physics concepts applied in optics, thermal physics, properties of matter and liquids. (b) Determination of acceptance angle in an optical fiber. Determination of thermal conductivity of a bad conductor – Lee‘s Disc method. Apply principles of elasticity, optics and thermal properties for engineering applications. To make the student to acquire practical skills in the determination of water quality parameters through volumetric and instrumental analysis. 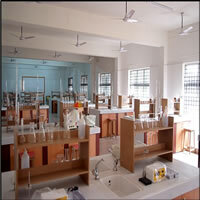 To acquaint the students with the determination of molecular weight of a polymer by viscometery. Estimation of HCl using Na2CO3 as primary standard and Determination of alkalinity in water sample. 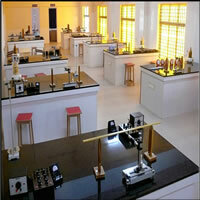 Determination of total, temporary & permanent hardness of water by EDTA method. Determination of DO content of water sample by Winkler‘s method. Determination of chloride content of water sample by argentometric method. Estimation of copper content of the given solution by Iodometry. Determination of strength of given hydrochloric acid using pH meter. Determination of strength of acids in a mixture of acids using conductivity meter. Estimation of iron content of the given solution using potentiometer. Estimation of iron content of the water sample using spectrophotometer (1, 10- Phenanthroline / thiocyanate method). Estimation of sodium and potassium present in water using flame photometer. Determination of molecular weight of polyvinyl alcohol using Ostwald viscometer. Pseudo first order kinetics-ester hydrolysis. Phase change in a solid. Conductometric titration of strong acid Vs strong base. The students will be outfitted with hands-on knowledge in the quantitative chemical analysis of water quality related parameters. To write, test, and debug simple Python programs. To implement Python programs with conditionals and loops. Use functions for structuring Python programs. Represent compound data using Python lists, tuples, dictionaries. Read and write data from/to files in Python. Compute the GCD of two numbers. Write, test, and debug simple Python programs. Implement Python programs with conditionals and loops. Develop Python programs step-wise by defining functions and calling them. Use Python lists, tuples, dictionaries for representing compound data.